A beautiful model of the Cretaceous predator Acrocanthosaurus by Rebor. “Hercules” has an articulated lower jaw and is made from a composite of PVC and polystone. 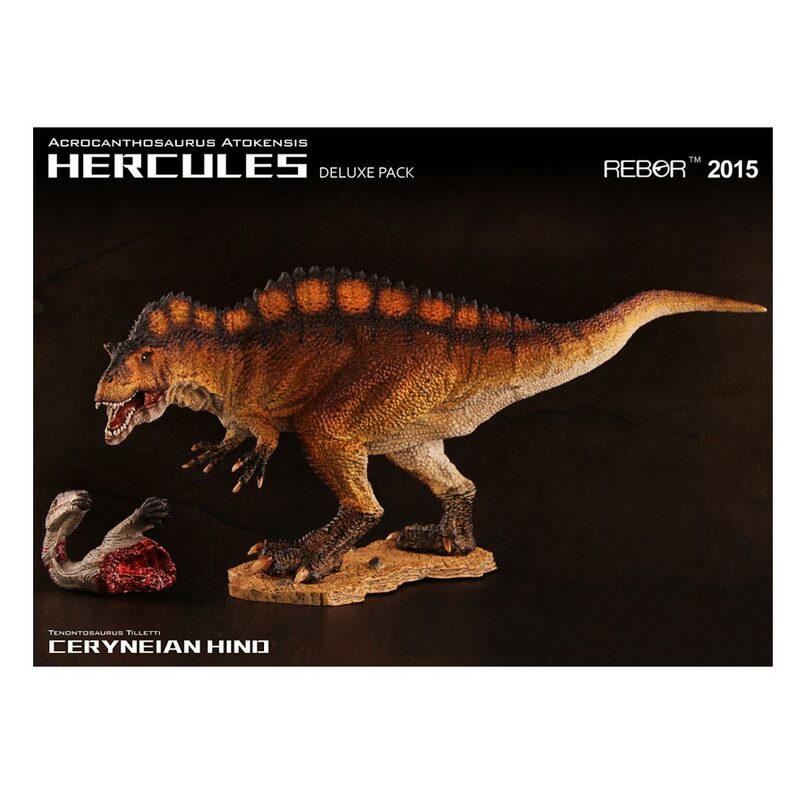 Rebor Acrocanthosaurus comes with a replica Tenontosaurus carcase that can be detached from the figure. A wonderful collector’s piece a super replica of Acrocanthosaurus atokensis. Length 31 cm approx. Height of main spine when on base 15 cm approx. Thank you so much for the fast delivery. The dinosaur arrived really well packaged and the inner box is really well presented. A bonus was a fact sheet which I know my son will enjoy reading. The dinosaur is detailed and worth the money. This figure is absolutely beautiful and menacing all in one. It scales up nicely to other dinosaur brands, and the Acrocanthosaurus can balance with or without his base, so posing options are endless! Unfortunately my figures jaw doesn’t open wide enough to hold the Tenontosaurus head, I’m not sure if others faced the same problem, however the head looks great in any articulated figures jaws (especially the running T rex by Papo). Thanks Everything Dinosaur for the amazing service! Also, fantastic model! Astonishing details, beautiful sculpture, nice paint job and colours. Worth every coin. Really looking forward to the several herbivores promised on Facebook, as well! Just purchased this recently and WOW! WOW! WOW!. Breathtaking work by Rebor. Cant find a single negative about this model. Detail awsome. Accuracy brilliant. Paint and finish stunning. Spent the first five days just stairing at it. Model comes with prey item accessory which can be placed in its jaws or at its feet for maximum effect. The eyes of the Acrocanthosaurus have very cleverly depicted without pupil in a transluscent gold colour and this works extremely well as you can imagine the Acro stealthily stalking its prey at dusk or during moonlight hours. The Rebor range has all the quality of the super detailed polystone replicas sometimes seen for sale without the megabucks price tag! I can honestly see these super figurines increasing in value as they become more sought after! Cant wait to see what Rebor bring ot next. Would love an Allosaurus , Stegosaurus combination. You owe it to yourself to get one of these. Also an absolute pleasure to deal with the team at Everything Dinosaur, They just make the whole ordering process so easy. Acrocanthosaurus is a great thing all over. certainly jaw joints. and dorsal very beautiful. you can watch it all day on the desk or bedroom. You can not take your eyes off it. thank you Everything Dinosaur. I look forward to the great future orders. A big beauty of a beast! I love the colour scheme. The best Acrocanthosaur on the market by far. Adding the torn prey that fits neatly into the jaws of Acro is a masterstroke! It`s a beautiful sculpt in itself! The Acro is becoming one of my favourite dino`s because of the sheer realism in this sculpt. Well done Rebor, and especially for putting the clear plastic between the legs to stop warping issues. Thanks to Everything Dinosaur for sending both this and my Ceratosaurus on Saturday and receiving them on Monday! Brilliant. Amazing detail, it looks awesome. This is the first Rebor model I’ve bought and I’m definitely coming back for more! EverythingDinosaur were great and dispatched it the same day, thank you! The Rebor models are highly impressive and, as Rhiannon also states in her review, they are worth every penny. Hercules is the best so far in my opinion. Worth every penny. The detail is utterly phenomenal. This is an extraordinary piece and Rebor have really done themselves proud! I especially love the coarse scales on Hercules himself, they’re very tactile. For sheer presence on a shelf, this for me beats even Rebor’s own King T. rex!